Ready to spend the night in the depths of the boreal forest in winter. Photo: Paul Kirtley. A lean-to is a classic shelter of the northern forests. It is an open-fronted shelter that depends upon fire to keep the occupant warm. This type of shelter has the advantage of a relatively simple construction method requiring few tools. As long as you have access to plenty of firewood, a lean-to will keep you protected from the cold in otherwise lethal temperatures. There are, however, a few tricks to getting it right first time. 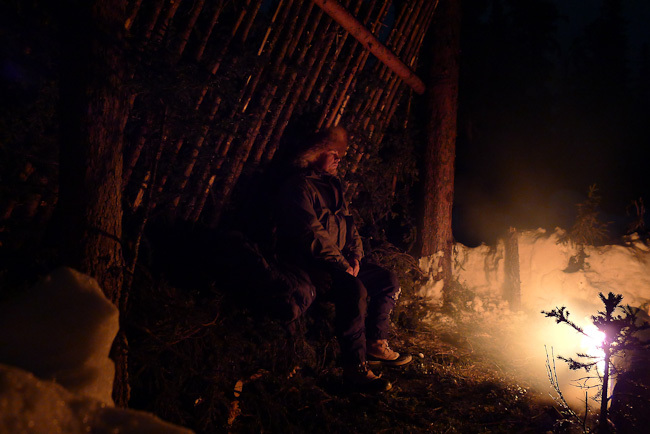 All the photos in this article were taken in northern Sweden, well inside the Arctic Circle. I slept out in the shelter depicted in night-time temperatures that hovered between minus 20 and minus 30 degrees Celsius. This is colder than inside a domestic freezer. I did so without the aid of any sleeping equipment – no sleeping bag, bivvy bag, blanket or the like. Moreover, I was not at all concerned about freezing to death and I did get a reasonable amount of sleep. This is the value of a lean-to. Before you begin constructing your shelter, you should take some time to find a suitable location and determine the appropriate orientation. Standard considerations for shelter-building apply with respect to positioning, orienting and building this type of shelter, with some of these considerations even more critical in a winter setting. Make sure there are no hazards overhead, from dead trees or hung-up branches. Think about the lay of the land – avoid localised low points where cold air will accumulate. This is particularly important in winter. Find the most naturally sheltered spot – any breeze will diminish the effectiveness of your shelter. Think also about gaining some protection from natural screens of small trees and overhead branches of larger trees. Standing out in the open on a clear night in arctic conditions, you can literally feel the heat escaping upwards from your body. Any overhead protection from live branches will be of benefit. A key consideration in building any shelter is the local availability of construction materials. When you are working on snow, even on snow-shoes or skis, the effort required to gather materials is multiplied. Make sure there are plenty of materials near to your intended shelter site. Given that a lean-to shelter requires a fire to keep you warm through the long winter nights, you will need a plentiful supply of firewood. The most efficient way of collecting firewood is in large pieces. Look for dead trees that are still standing. Moreover, if you want to get any sleep rather than tending the fire all night, your firewood must be substantial in size. It will burn with a steady heat for a reasonable period of time, allowing you to get your head down. I look for one or two dead-standing pine trees in the immediate vicinity of where I am going to build the shelter. The orientation of an open-fronted shelter is critical. Ideally the shelter, fire and any breeze or wind are parallel. There is a common misconception that putting the back of the shelter to the wind is beneficial. While it is beneficial in terms of being a wind-break, there will also be an effect like water flowing down a rapid. That is, there will be an eddy which re-circulates in the opposite direction. If the back of the shelter is to the wind, the re-circulation of air – and smoke from the fire – is back into the shelter. This is very unpleasant for the occupant of the shelter. Better to put ends onto the shelter and have the breeze blowing across its open front. Finally, if you can, orientate the shelter so that the open side of the shelter gets the sun during the day. Assuming you are living and working out of the shelter, this will help keep you warm during the day. If you can only get the sun for part of the day given the other constraints such as wind direction, getting the sun onto you and your shelter in the morning will make the most difference. 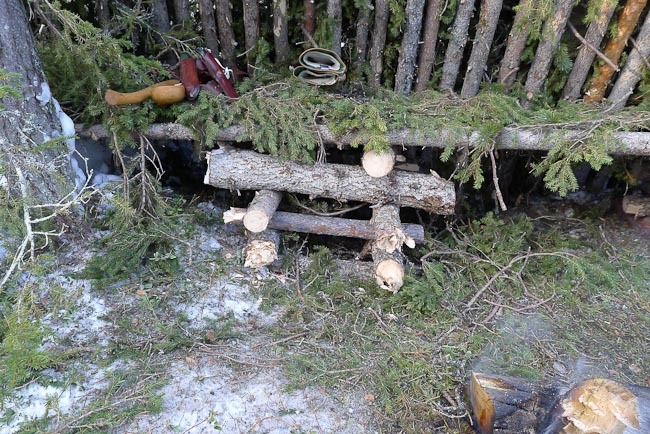 You could build a lean-to with only a belt knife and a folding saw. It would, however, be very difficult to complete within a day. 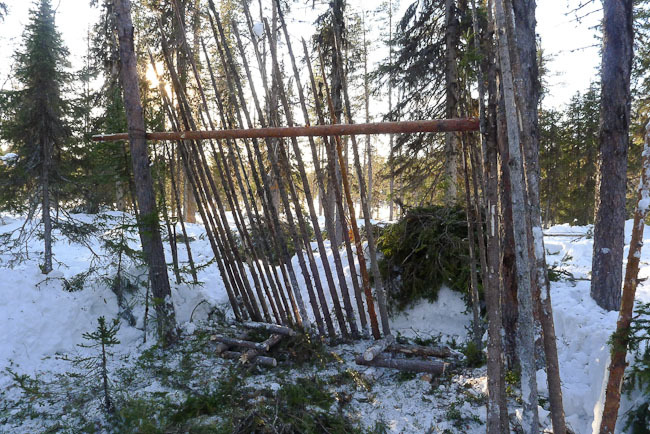 The more critical point, though, is that with only these tools you wouldn’t be able to access the size of firewood needed to make this shelter work for you. An axe is the most important tool you can carry in the northern forest. In high latitudes the growing season is short. Consequently, trees grow slowly and their wood is dense and knotty. In winter, you always need to process a lot of firewood, even if you are staying in a heated tent or cabin with a stove. An open-fronted shelter such as a lean-to is very inefficient in its use of fuel. In one night you will burn as much firewood as you would in several days in a heated tent. An axe is the number one tool in this environment. An axe is the most important tool you can carry in the northern forest. Photo: Paul Kirtley. 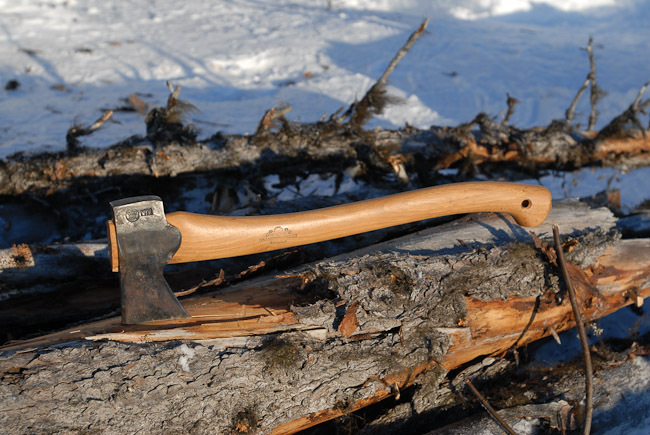 Make sure you are familiar with using your axe in mild conditions before heading out into the north woods in winter. Even then, still be extra careful. Using an axe while wearing gloves or mittens, on skis or snowshoes, with snow rather than solid ground under your feet, increases the risk of mishap. Build up proficiency with an axe before you head to more difficult climates. While you are there aim for efficiency. Photo: Stuart Wittke. You should also make sure you are efficient with your axe. 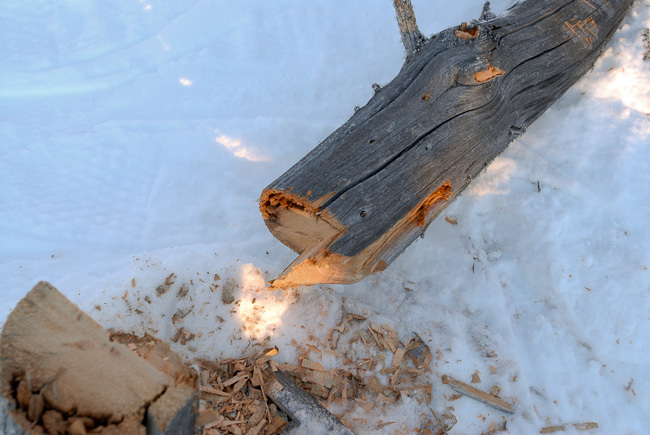 To get the most out of your axe in winter, your skills with it should be well honed. Precision and the ease of long use only come with practice. 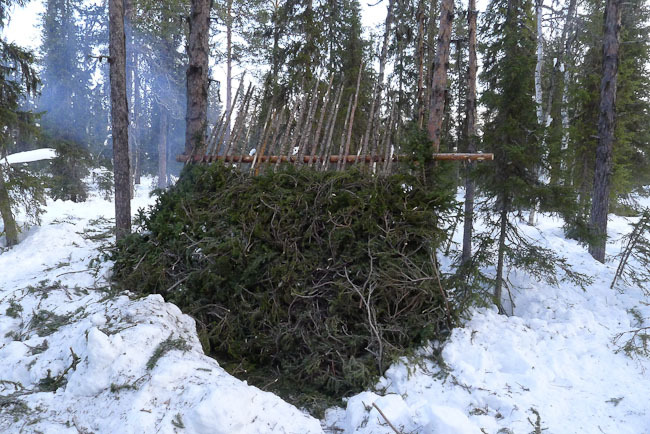 Specifically for building this shelter you should be quick at harvesting and limbing small trees as well as cutting poles to length while holding the pole in one hand and the axe in the other. For firewood, you should be confident in safely felling, limbing and sectioning trees of over 12 inches (30cm) in diameter. 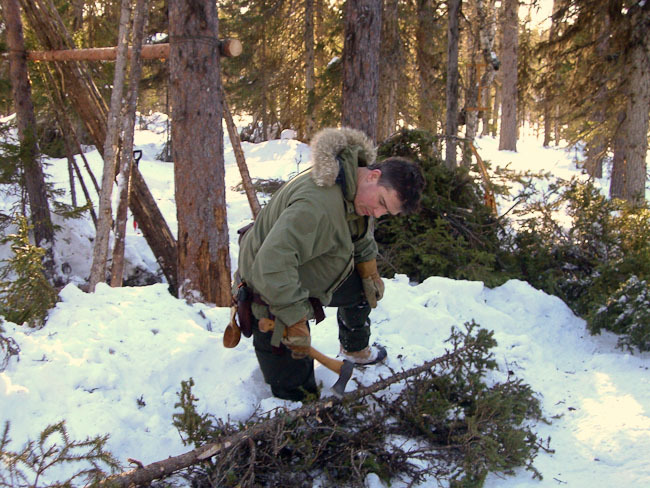 These are the basic jobs of winter survival with an axe in the boreal forest. While an axe is the essential tool, a saw will come in handy. Some jobs are quicker and more efficient with a saw. For example, when sectioning a tree trunk, a saw is less wasteful of materials and energy. It is also safer. A saw also makes felling trees safer too, as the back cut can be more finely controlled. You will need to safely fell dead-standing trees for firewood. Photo: Paul Kirtley. A snow shovel is a much under-rated tool of the north. A good one makes moving lots of snow relatively painless. A key feature is a long handle or, at least a handle that will extend to a good length. The aim is to be able to move powdery snow in a broad, sweeping motion from an upright standing position. To build your shelter you will need to clear an area of snow, down to the ground underneath. If you have a snow shovel, make good use of it. Otherwise you will have to improvise (more on this below). 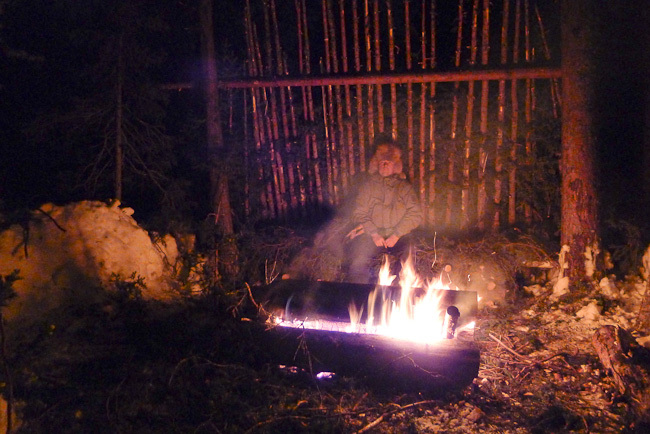 The open fronted lean-to arrangement is dependent upon fire to keep you warm. Therefore, you must be able to light a fire. Carrying with you several means of lighting a fire is a basic survival tactic. Here sparks and matches work well and are reliable. There are common natural materials such as birch bark and tree lichens that will readily take a spark or small flame. Small kindling abounds on the lower trunks of spruce trees. Once you have chosen the site and orientation of your shelter, you will need to find a couple of sturdy trees with enough space between them to house your shelter. Then you can get down to the business of construction. First you should clear an area sufficient to house a raised bed, fire and the area in between. While possible without a shovel, this is much easier with a shovel or similar implement. Snow in the northern forests typically remains powdery and can even transform to a sugar-like crystals, which are even harder to move in any great quantity without the appropriate tool. If you don’t have a shovel, improvise something to scoop snow, preferably with a sweeping motion from a standing position. Provided you have an axe, you can rough out a long-handled snow scoop of a similar size to a canoe paddle but with a curved blade. The action of using this is similar to a canoe paddle too. Alternatively, you could use a snowshoe, improving its ability to hold snow with a covering of any spare cloth or plastic you might have with you. 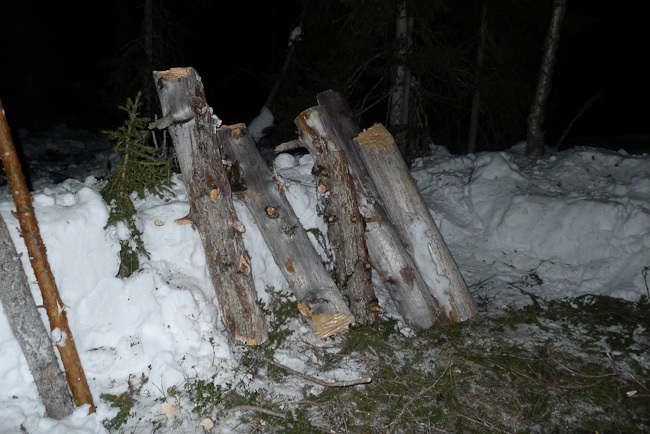 Second, you need to locate and cut a sturdy cross beam for your shelter. This, like all the other structural parts of the shelter, should be made from green (i.e. live) wood. This cross beam is then lashed between the two trees you have chosen. In the northern forest in winter, it is not possible to improvise natural cordage. While there are abundant spruce, pine and birch roots below the ground, the earth is frozen solid. Carrying some cordage with you is also a basic survival strategy for this environment. If you do not have any cordage, or do not have enough to spare, you can prop the crossbeam in place with sturdy Y-poles from the front of the shelter. In either case, the cross-beam should be placed between the leaning back wall of the shelter and the upright trees. This way the weight of the bulk of the shelter is forcing the cross-beam onto the uprights rather than trying to separate it from them. The height the cross-beam should be lashed onto the trees is determined by the height and width of your bed and the desired angle of the back wall of the shelter. Generally an angle of around 60 degrees is good. If there is any chance of wet precipitation (e.g. sleet or rain) then 60 degrees is the absolute minimum angle. The bed should be wide enough for you to lay on it and high enough off the ground that you can sit on it at normal chair sitting height. Once you have lashed on the cross-beam, add green poles at the desired angle. Collect the trees and bring them back to the area of the shelter to remove the branches. These will provide the thatching and bedding material for your shelter. If any of the poles are too long, you can trim them down, using the excess to form the basis of the platform for your raised bed. With the cross beam in place, the poles for the back wall can be added. Note the beginnings of the raised bed and thatching materials being stacked nearby. Photo: Paul Kirtley. Ideally, you will lay the poles right next to each other, with no gap in between them. This makes for an awful lot of work, as well as requiring the felling of up to one hundred live trees. Spacing the poles at around a hand span apart is a suitable compromise, particularly if you are not in a survival situation. This will prevent the thatching material from falling in between the poles but will not be quite as wind-proof as having the poles side-by-side. Work in progress – daylight still coming through the thatching. Note the spacing between the poles in the back wall. Photo: Paul Kirtley. To sleep out in this environment, you should be insulated from the ground, to minimise conductive heat loss. Air is a good insulator. If the underside of the sleeping platform is kept open to the fire, this will also allow radiant heat and the circulation of warm air under your bed. Raised bed platform construction detail. Photo: Paul Kirtley. The basic bed platform should be made of long poles that have a little give in them. In this environment spruce is best. They should all be of similar diameters. Any tapering can be compensated for by laying the poles head-to-toe. This is then covered with spruce boughs. While a thick mattress of boughs makes for greater comfort in its own right, it also insulates you from the warmth of the fire coming up from under the bed. So, you have to strike a balance between both these components of your comfort. The underside of the raised bed is open to the fire; don’t apply too much insulating bedding on top – just enough for comfort. Photo: Paul Kirtley. When thatching the back of the shelter, start at the bottom of the rear wall and thatch upwards, working right across the wall. You are aiming for the material to be 30-40cm thick at a minimum. Place the branches on with their stems facing upwards as much as possible, interweaving each new row with the last. Remember to also thatch the head and the foot of your raised bed to minimise draughts. An optional addition for extra wind-proofing is to add snow to the back of the shelter, over the top of the thatching material. There are various fires you can use with this type of shelter. All of them have one thing in common – they lie parallel to you and your bed. The length of the fire should be at least the same as your height so you are warmed from head to foot. A classic, easily constructed long-log fire is made with three logs – two at the base and one on top. The thickest log you have goes on top. There is an old saying in the north that “wood as thick as a capercaillie will burn all night”. That’s a pretty big log! You need large diameter logs to burn all night. Keep them long for a parallel long-log fire. Photo: Paul Kirtley. The knack with this type of fire is to get the logs burning steadily and giving out heat like a grill. You start by placing two logs on the ground and lighting a fire in the usual manner in between and making sure it spreads along the full length of the logs. Lots of small sticks and some intermediate sized fuel ensure this. Now, if you put a large log straight on top of this lot, it practically smothers the fire. This means lots of smoke and not much heat when what we really want is the opposite, little smoke and good heat. Place two logs on the ground and plenty of kindling in between. Photo: Paul Kirtley. Allow the fire to establish between the two base logs. Photo: Paul Kirtley. The trick is to hammer some substantial pieces of green wood (about 2 inches/4cm in diameter) diagonally between the two logs to form an X-shape at each end. The large log is then cradled by these X-stays and held separate from the logs below. You obtain a constant flame which gives off a good heat from the gap in between. The stays take a good while to burn through as they are green. Fire with top log in place warming shelter. Note the X-stays of green wood to maintain separation. Photo: Paul Kirtley. The common mistake with this fire is the put it too far away from the shelter. This misjudgement is often based on sitting on the raised bed and feeling the warmth on your legs. When you lie down you are then too far from the fire, particularly when it dies down a little. This looks good but the fire is too far away from the shelter to be effective. Photo: Paul Kirtley. 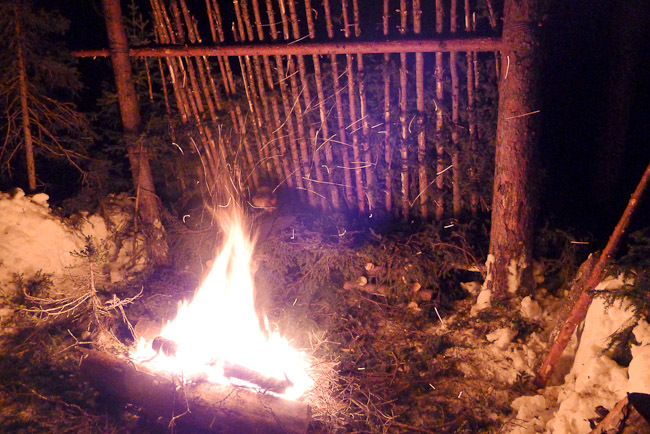 The fire needs to be close enough to be able to warm the rear wall of the shelter, which will help keep you warm indirectly, adding to the direct radiant warmth of the fire hitting your body and the warmth coming up under your open-fronted raised bed. This all translates to the fire needing to be a short step away. 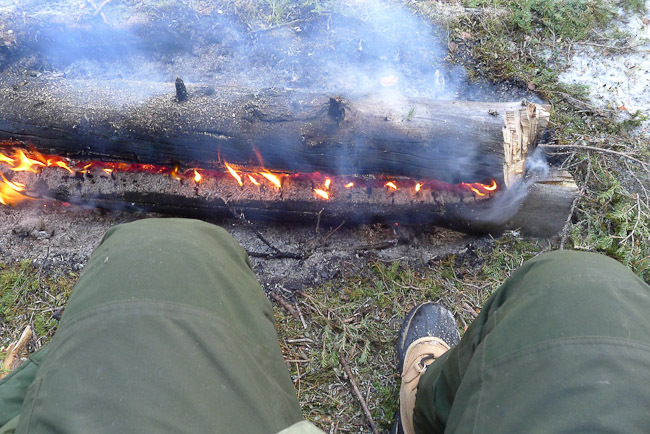 You are left with just enough room to get your feet down in between the shelter and the fire while sitting on the bed. 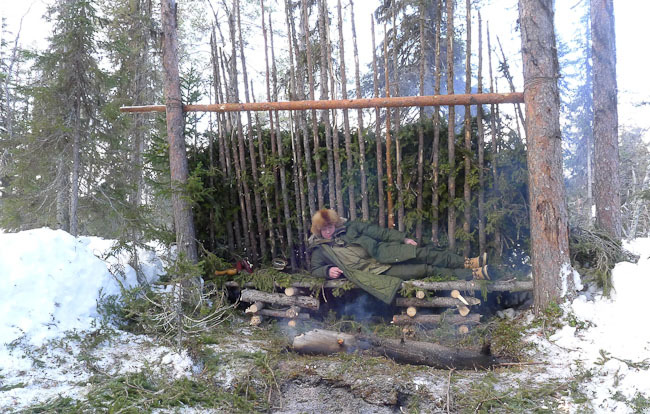 The correct separation of shelter and fire for adequate warmth while sleeping. Photo: Paul Kirtley. Only a short step away from the fire! Photo: Paul Kirtley. You can of course sleep in this shelter using a sleeping bag or a blanket if you have one. Just be wary of sparks melting holes in synthetic shell materials. If you apply the principles above correctly then it is perfectly feasible to spend the night outside in arctic conditions in only the clothes you are wearing. If you have a big overcoat, you can use this as a blanket. Personally I find I sleep best on my side with my front facing the fire. Therefore I tend to keep wearing the overcoat but have it open at the front – this means my back is kept covered and warm while my front gets the benefit of the fire. There is a common myth that you will not wake up if you get too cold. I can assure you that as soon as the fire dies down a little and you start to feel the chill of the night, you will be awake. As the fire dies down, it also tends to produce more smoke which, if it comes your way, will also likely wake you up. Once you are awake, the job is then to adjust the fire so that it regains the warmth required for you to fall back asleep. Make sure you have plenty of wood ready before dark. You’ll burn through more than you expect in a night and unless the logs you are using are huge, you’ll probably have to replace at least the top log during the night. The morning after! Photo: Paul Kirtley. So, you will manage to sleep. It will just be in shorter stretches than you are used to. You will likely feel tired the next morning but you’ll be warm and alive. 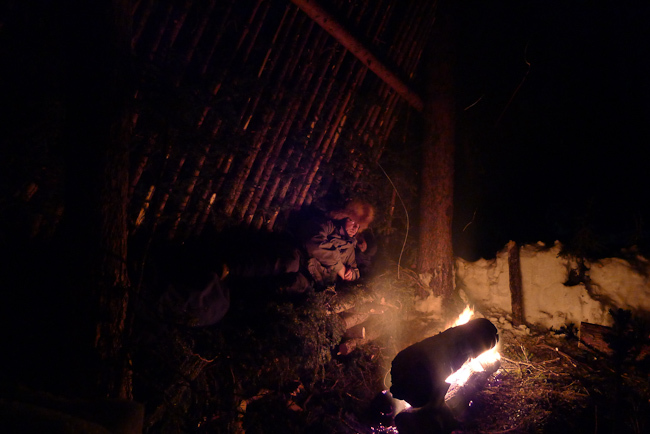 You will also have the inner glow that comes from surviving a night out in the open in the arctic forest with nothing other than your bushcraft skills and knowledge. Really great article Mr. Kirtley, I thoroughly enjoyed reading through it. Thank you Niels, your comment is much appreciated. I’m glad you enjoyed the article. Another excellent article and very well written. 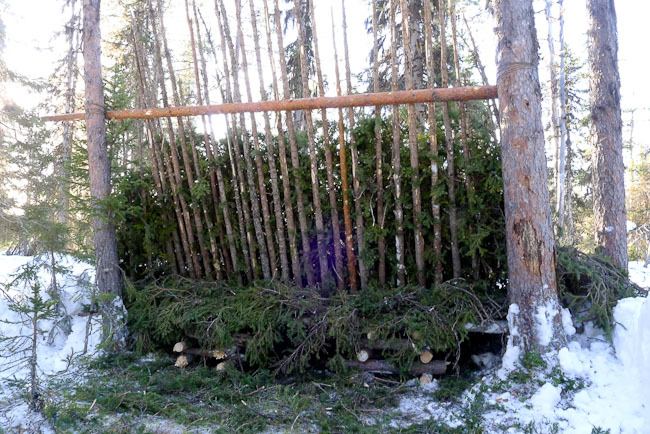 I have been building one quite like yours Paul, but i have only been working on it when time allows, between my bushcraft training, it has taken me months to construct my long-term shelter and it is very hard work. The design is the same more or less, taking pics stem-by-step; you get a real sense of achievement when its in its final stages, no more sweating. My mate CHURL built one in Delarmere forest, it looked like a Hobo Hut. Good to hear from you. It’s good to read that you have been working on a similar shelter. Building a decent shelter is a lot of work but once you have it built, you can use it for a considerable period of time. Speed and efficiency with your tools is key to completing a serviceable shelter in a realistic amount of time. 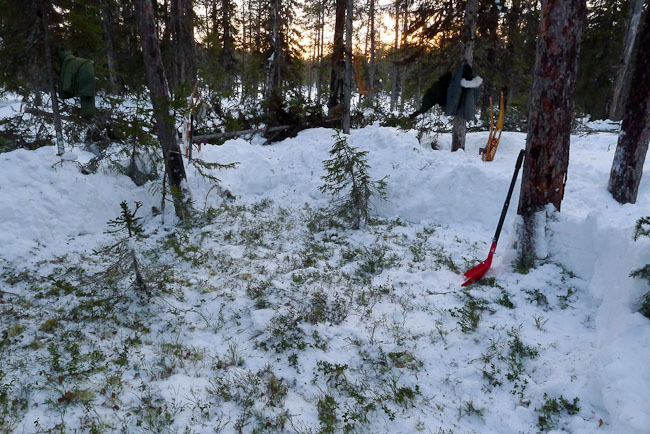 With good axe skills and the right resources to hand, the type of shelter in this article should be manageable in a day. As with every part of bushcraft, the more you practise the skills, the quicker you will be able to complete tasks. This is one of the hidden benefits of bushcraft that is not mentioned very often – when you become skilled, so much more becomes possible than it did before. It’s a good point you make about the appropriateness of building such a shelter in different circumstances/locales. Building a lean-to properly does require a lot of material. Even in building the shelter featured in the article, I was sparing with the rafters at the back. If my life depended upon it, I would cut enough poles to fit them side-by-side without any gap. Even if you can’t or don’t need to build this particular type of shelter closer to home, the point about re-circulating air is valid for any open-fronted shelter with a fire in front of it. That’s a piece of knowledge you can take anywhere with you. I like the way you stacked up those logs at the ends to get the bed up off the ground. Simple and fast, great job Paul & great artical. Yeah that works really well. And you can select the sizes you want to fine-tune the height of the stack. This way you get a really good, stable and level bed. This is best article on lean-to building i have seen (and i have seen many)! You mention the pros and cons and how to deal with them as well as what you can reasonably expect in stupidly cold climates. Thanks for your comments – both here and on Facebook. I’m glad you liked the article. It’s very kind of you to be so complimentary. I really like this article alot. It is very clear and well writen. My friend and I use a very similar shelter for winter trapping here in Alaska. We usually end up building a reflector on the other side of the fire to send more heat into the shelter. Do you have any advise for two person shelters of this type? It’s good to hear from you. I’m glad you liked the article. It’s interesting to read that you do something similar. While you can of course build two lean-to shelters facing each other with a fire in the middle, this almost doubles the work required for construction. This may be worth it for a semi-permanent set-up but if you need to get this type of shelter up as quick as possible, then just make the shelter a little longer than it needs to be for one person and sleep with your legs overlapping. With this arrangement one person’s legs are going to shadowed by the other person’s and so won’t get as much heat but you can always swap during the night (you’re unlikely to sleep through til dawn anyway). The important thing is that your torso is not shielded from the fire so that your body core is warmed. Obviously you need a slightly longer long-log fire too. The shelter in the photos in my article would be big enough for two people but the fire illustrated was only for one. Good article with good tips, often the fire is made too far away from the person. Thanks for your comment Rody. Yes, people underestimate how cold they will get at night, particularly through heat loss to the ground. Definitely one of your best articles ever Paul, very helpful and instructive. It’s good to hear from you. Thanks for your kind words about the article. I’m glad you found it interesting. Best wishes to you and Buzzard Bushcraft for the New Year. Excellent article, i moved to norway in the autumn and I cant wait to get out to play in the snow. I have made many shelters like this in the uk, but the added challenge of the cold will make it an interesting challenge. Ps are there any plans to run any arctic expeditions/trips in the near future through your company? Thanks for your comment. If you like snow then your are a lucky man moving to Norway. I’ve done some really enjoyable ski tours in Norway. What part of the country are you in? And yes, we are looking at various options for trips in Scandinavia. Kristiansand, in the south but im up in bodø and tromsø for the holiday. I love the snow, that was the main reason I moved, so im getting stuck in about the nordic skiing at the moment, starting to get reasonable at it and now im falling over much less, hopefully I will be good enough to make some longer weekend trips soon, so cant wait for that. If ever you need some were to stop off on one of your trips etc feel free to give me a shout. Yep, I know Kristiansand. A friend of mine lives in Evje. I’ll try to look you up the next time I’m over. Thank you for this great article. I thought you explained everything well and clearly and your photos really illustrated your points well. Another superb article. I would buy this blog in book form, it would make the best bushcraft book on the market. One book to rule them all….that for sure ! Don’t know what Hedgey is on about, last time I saw him he was wearing a Bear Grylls jumper, and also trousers I think……I’ll say no more. It’s good to hear from you. It’s been a while. I’m guessing you’ve been wandering up Borrowdale somewhere? Thanks for your comment. I think I may indeed have to collate these articles into a book. A few people have asked for this recently. I’ll be in the snow again soon for more adventures. hahahaha this has cracked me up laughing at the Ghoastbuster’s styled clothing. Funny thing is, Hedgey was wearing blue just like the Ghoastbuster in the link. I’m going to have tease him with this, he’ll be rattling his brains trying to work it out. or will this be to steep? 60 degrees looks very steep to me..
BTW, i really enjoy your article’s, keep them coming! Enjoyed your article. Very thorough, and tested! I recently had a very close call here in Colorado with frostbite and altitude sickness. Unfortunately we were above treeline so a wood shelter was impossible. Luckily we made it to a hut with a stove and lived. Still good to have a fund of knowledge about these simple techniques, however. I’m glad you liked the article. Yes, definitely tested. Everything I write about comes from practical experience. I’m sorry to hear that you had a close call but I’m happy you made it. Sounds like that hut was a godsend. I’ve done some trips in the mountains in Norway where, even though there was no danger of AMS, the low ambient temperature combined with high level of wind chill was perilous. In particular, I remember one day where we reached a hut in what was pretty much a whiteout. It was blowing fiercely and I had to dig out 6 feet of snow which had drifted over the door, just to get in. When we got in, it was minus 18 degrees Celsius (0 Fahrenheit) inside. But I was still very glad to get inside! A few hours later, with the aid of the woodburner, we had raised the temp by 40 degrees Celsius. These experiences become etched on your brain. 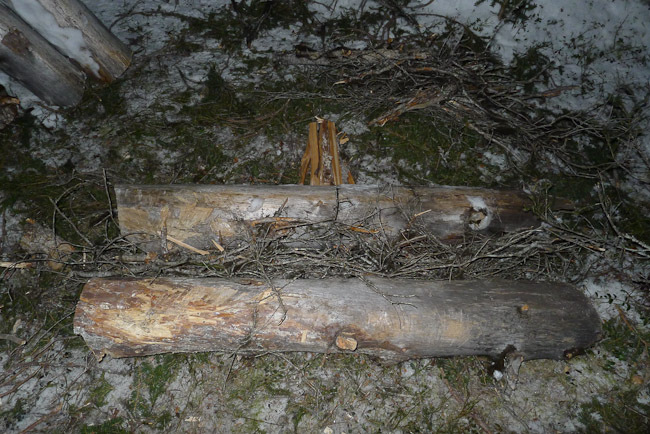 I remember having read, in a book with Sami fire lore, that using a fresh birch log as your top one (with dead standing pine as your two bottom ones) is a good way to make your long log fire last longer and the heat more raidiant to the sides. I wondered if you have had any experiece with this modifikation? I have never had the opportunity to try this but when a “Tre stockar” fire would be too rapid, I have employed what the Sami call nuorssjo. Have you tried the three-log fire with a green birch on top? That is indeed the passage I was thinking about. Yes Nuorssjo seems to be more commonly used and known. 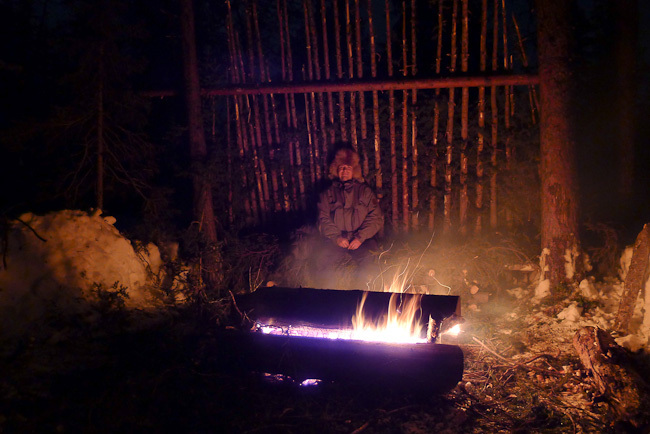 I have over all very good experience with fresh birch as fuel, frequently using it both summer and winter. I really enjoy the longevity and heat of the coals produced but also find that fresh birch have a calming effect on me. Might be the pleasant aroma it gives off combined with the “calm” way it burns. That said I have not had the opportunity to try it in a long-fire yet mostly because I have not had a landowners permission to cut down any large living birches, only using for fire the small stuff that the owner would clear anyway or that have already recently been cut down. I also have good experience with using seasoned birch as fuel. I find green birch here in the UK holds a lot of water and does not burn so well and gives off a lot of smoke as well as hissing in the fire as the water boils out of the ends of the logs (not so calming). In the northern forest in winter I also find birch a poor substitute for dead standing spruce or pine for smaller fires. In my experience even dead standing birch can hold quite a lot of frozen moisture in comparison to spruce or pine, particularly if it is a little bit soft or punky. That said, birch burns quite well if added to an already hot fire and you don’t get the acrid black smoke you get from resinous pine and spruce. Plus you can test if it is wet or dry by taking a slice and testing it on your tongue. Choosing well makes a big difference. My reason for not having tried the large green birch log on top of the long-log fire is similar to yours. It’s not that I didn’t have permission, just that I didn’t feel justified in taking down a large birch just to satisfy my curiosity. One day the opportunity will present itself. As always many thanks for so generously sharing your experiences. I see were you are going with the use of fresh birch having some drawbacks. Especially so in your own woods. In general I think (and I am sure you agree) that most fire wood has its certain niche, as to when and under what circumstances it is most appropriate to use. I think it is important to know of many different sources of fire wood and how to use them and in that regard I hope fresh birch becomes more widely known. It has imho a few very good properties, especially for a “survival” or extended trip situation. For one in the north and especially at higher altitudes fresh birch might be the only firewood available in large enough enough quantities for practical extended use. 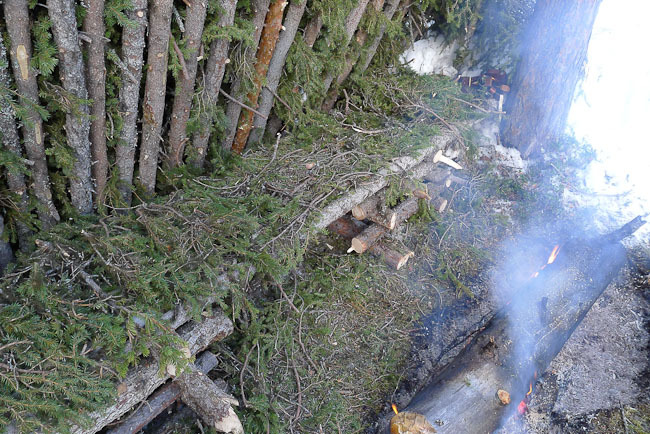 Also burning without throwing sparks is a very good quality in certain type of shelters when you want a fire inside but don´t have a wood stove. Also the long lasting coals, long burn time as well only burning when properly spaced has some distinct advantages for a fire being inside a (or close by) a shelter especially a more primitive one. Finally I also think that resulting in very hot coals combined with a lack of “black resinous” smoke makes it a good alternative for a cooking fire. I especially enjoy not having to clean my coffee pot very much :-).. Even though on regards of the wood not burning as hot as many others I might have to wait for my coffee a little longer. That said, it does often require a good hot “starter” fire to get going, gives of more smoke and does not burn as hot as many other woods (even though the coals are very hot). If those qualities are preferred I would not use fresh birch unless nothing else being available. Hi Paul ,another great article . After all that work making the shelter would you leave it standing or take it down after use (no trace and all that)? Also what would you do with any large pieces of fire logs left afterwards( Do you burn them off whole or split them out, or something else?). Good questions. I think it depends on where you are. I don’t think there is a general right or wrong answer. I try to burn the dogs off as much as possible. If I can’t, I leave them standing on end to be re-used by me or some others in the future (but only in places where there is very little use of the resources there). For further thoughts on long-log fire use, you can see my article here: http://paulkirtley.co.uk/2015/how-to-build-a-long-log-fire/. Great artilel. I will pass it on here in the states. But Have you heard about Penelope? Well she was your typical middle-class teenage kid. Nice home, played softball, got good grades, and her family was popular in there subdivision. The kook up the street use to ask if she and her famy were prepared? Then the SHTF. So this kook asks you all Are You Prepared?. If not visit our Preppers Asylum Facebook page and visit our website preppersasylum.com there you can browse through our store. Should you purchase anything use promo code PBN at checkout and receive 10% off of your order. You can also read about the saga of Penelope on our Preppers Asylum Facebook page. Thank you. Fantastic article thank you for writing it. Clear,concise and detailed enough to give a clear picture. I really like your work and your generosity with regard to the knowledge you share. This article is very helpful but I miss something. You wrote that you built this in Sweden? Well, I hope you had special permission for felling trees because if I would be there the Alemannsrätten (hope there’s no typo…) would keep me from felling any tree except for emergency…. Hi Andreas, thanks. Yes, I did have permission.